We’ve written about Socialcam before at its launch and when it updated to add special effects filters. The last time we talked to Michel Seibel, he told us that they would settle for nothing less than replacing your video camera. The challenges to that are substantial. Seibel acknowledges that the success of apps like Instagram have a lot to do with the fact that users can get decent looking images out with far more ease than they can produce video that they’re proud to share. With its latest release, Socialcam 4.0, the app brings along a new video workflow that should help to lower the barrier of sharing even more. The new app keeps the custom filters, but adds themes with beautiful typography and soundtracks to the mix, allowing you to create fully produced video memories in seconds. These aren’t just a few seconds of video with filters on top, these feel like video productions with overlay titles, splash screens and more. Its’s an insanely quick and simple experience to create a video with a full-on title sequence, music and a filter. You can shoot the filter effect live and then tap through the naming procedure on to the editing screen. The effects pull metadata from your video automatically to title things like time or location and use your name and titles automatically. The soundtracks are chosen with care and aren’t your typical stock music clips at all. They are soundtracks courtesy of a music partnership with Friendly Music, itself an offshoot of Rumblefish, a company that provided soundtracks for over 5 million online videos. The licensing is 100% covered, so you can share your clip wherever you like including social networks and Dropbox. You can also mix the soundtrack in live on the fly. For an example the final product of just a couple seconds of editing, check out this short clip. The real kicker to all of these editing choices? All of the effects are rendered completely live. That means that you can share seconds after you finish shooting. This is incredibly important with video, because there is typically so much fiddling around in multiple apps to get a clip worth sharing. SocialCam eliminates all of that to get the experience of sharing a great looking video as close to that of sharing a still image as possible. In addition to the theming, Socialcam also now integrates with Facebook’s Open Graph, as well as Twitter account signup. There has also been a boost in overall video quality. One of the coolest additions is the ability to see when your Facebook friends, specifically, actually watch your video. This is cool because it gives you a live ‘read receipt’, similar to iMessage. People that you care about are watching and enjoying. 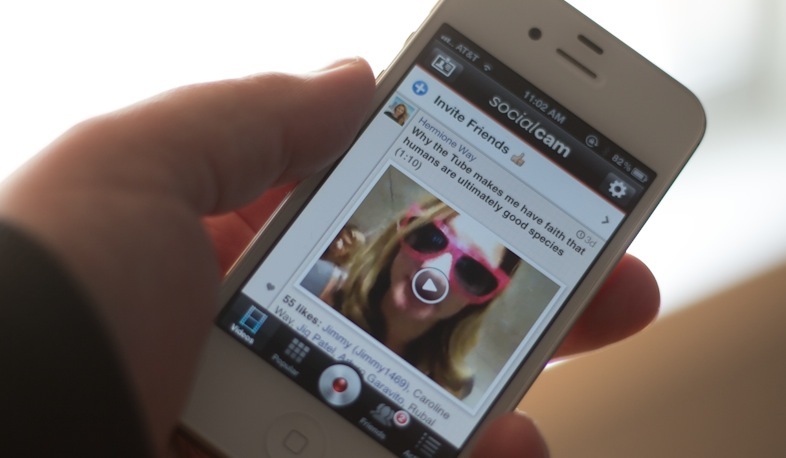 Socialcam has had over 3 million downloads at this point, but Seibel knows that they have a ways to go yet. Socialcam’s goal is that they want to make it the first app that makes videography as popular to the general public as the Polaroid camera did for still photos. It’s a tall order, one that requires that Socialcam do as much to lower the sharing barrier as possible. The latest app does a lot to further this goal, producing better looking — and more polished — video than ever before. Read next: Pair wasn't the first "social network for couples", remember Cupple, Duet, and Between?